Entanglement is a key resource for upcoming quantum computers and simulators. Now, physicists in Innsbruck and Geneva realized a new, reliable method to verify entanglement in the laboratory using a minimal number of assumptions about the system and measuring devices. Hence, this method witnesses the presence of useful entanglement. Quantum computation, quantum communication and quantum cryptography often require entanglement. For many of these upcoming quantum technologies, entanglement – this hard to grasp, counter-intuitive aspect in the quantum world – is a key ingredient. Therefore, experimental physicists often need to verify entanglement in their systems. "Two years ago, we managed to verify entanglement between up to 14 ions", explains Thomas Monz. He works in the group of Rainer Blatt at the Institute for Experimental Physics, University Innsbruck. This team is still holding the world-record for the largest number of entangled particles. "In order to verify the entanglement, we had to make some, experimentally calibrated, assumptions. However, assumptions, for instance about the number of dimensions of the system or a decent calibration, make any subsequently derived statements vulnerable", explains Monz. Together with Julio Barreiro, who recently moved on the Max Planck Institute of Quantum Optics in Garching, and Jean-Daniel Bancal from the group of Nicolas Gisin at the University of Geneva, now at the Center for Quantum Technologies in Singapore, the physicists derived and implemented a new method to verify entanglement between several objects. The presented device-independent method is based on a single assumption: "We only have to make sure that we always apply the same set of operations on the quantum objects, and that the operations are independent of each other", explains Julio Barreiro. "However, which operations we apply in detail – this is something we do not need to know." This approach - called Device Independent - allows them to get around several potential sources of error, and subsequently wrong interpretations of the results. "In the end, we investigate the correlations between the settings and the obtained results. Once the correlations exceed a certain threshold, we know that the objects are entangled." For the experimentally hardly avoidable crosstalk of operations applied to levitating calcium ions in the vacuum chamber in Innsbruck, the Swiss theorist Jean-Daniel Bancal managed to adapt the threshold according to a worst-case scenario. 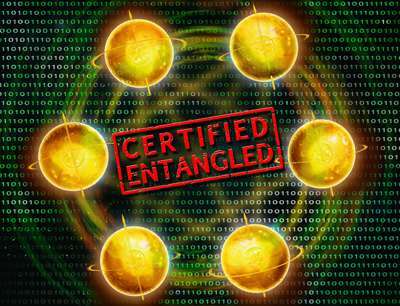 "When this higher threshold is breached, we can claim entanglement in the system with high confidence", states Bancal. For physicists, such procedures that are based on very few assumptions are highly interesting. By being basically independent of the system, they provide high confidence and strengthen the results of experimentalists. "Assumptions are always the Achilles heel – be that for lab data or theory work", stresses Thomas Monz. "We managed to reduce the number of assumption to verify entanglement to a minimum. Our method thus allows for reliable statements about the entanglement in a system." In the actual implementation, the physicists in Innsbruck could verify entanglement of up to 6 ions. This new method can also be applied for larger systems. The technical demands, however, also increase accordingly. What if quantum physics worked on a macroscopic level? For physicists, such procedures that are based on very few assumptions are highly interesting. By being basically independent of the system, they provide high confidence and strengthen the results of experimentalists…... Our method thus allows for reliable statements about the entanglement in a system." In the actual implementation, the physicists in Innsbruck could verify entanglement of up to 6 ions. This new method can also be applied for larger systems. The technical demands, however, also increase accordingly. Stupid question: is entanglement possible between MORE than 2 particles?? ?